Mega actor Naga Babu has been making some harsh comments on Nandamuri Balakrishna through his official social media page. A series of videos released by Naga Babu did not go well with Nandamuri fans. Mega brother Nagababu has been making it into the news with controversial comments on Nandamuri Balakrishna. He even posted videos on social media saying that he doesn’t know who Balakrishna is. Nandamuri fans are disappointed with Nagababu’s behavior and are fuming with anger. What Balakrishna is going to say about Nagababu has become a hot topic. During the promotions of ‘NTR Kathanayakudu’, Balakrishna paid his visit Tirupati along with Vidya Balan, Sai Korrapati and Vishnu Induri. He also inaugurated the first Idol of NTR in PJR theatre. 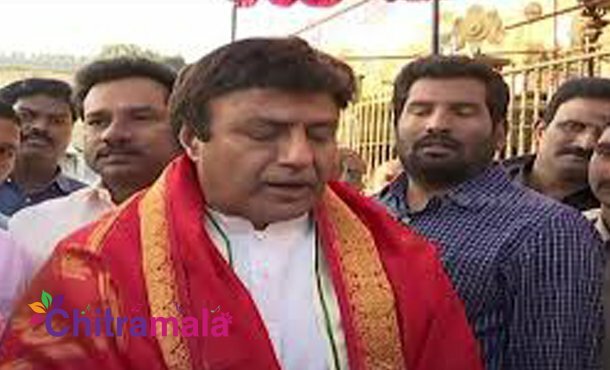 While talking with media, one of the reporters asked Balakrishna to react on Nagababu’s comments. But Balayya just skipped the question saying “No Comments”. It seems like he does not want to react to the comments and wants to stay calm on this issue. On the other hand, directed by Krish Jagarlamudi, the first part of NTR biopic ‘NTR Kathanayakudu’ is gearing up for a grand release on January 9, 2019.